I’m a beginner in the sewing world. And by beginner, I mean I’ve never sewed anything more than fixing a quick hole in a pocket or sewing a loose button back on. I’ve never worked a sewing machine once in my life, and the thought of trying scares me. I still have no idea what I was thinking when we bought this chair on craigslist. It was a steal at $20. 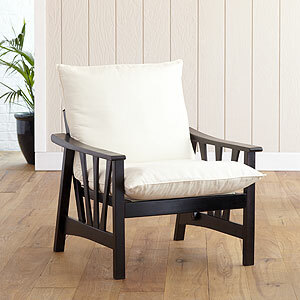 It has a strong and sturdy wooden frame and we could easily get some slipcovers for those cushions. Well, all didn’t go exactly as planned. 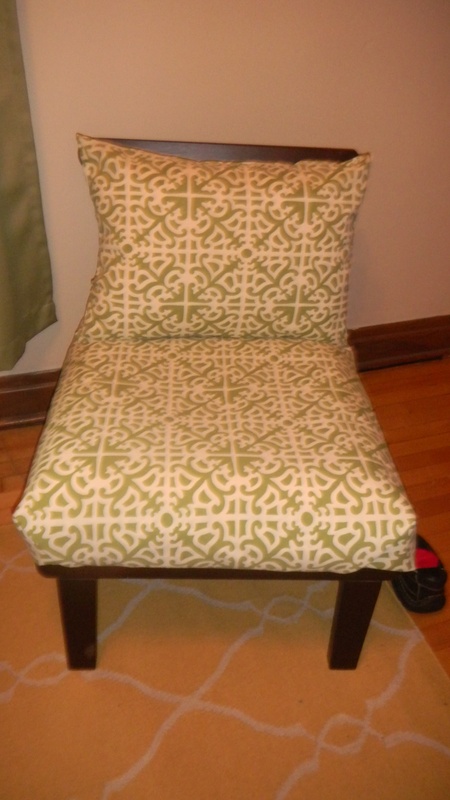 First, this style of chair from World Market had been discontinued. No problem, I thought. I thought the Casa chair currently sold at World Market was close enough that we could just purchase slip covers for those chair cushions and all would be fine. You probably noticed it already. The back cushion of the Casa chair is a lot bigger than ours. I thought about getting a slip cover anyways, then pinning the material so it fit correctly, but that was dashed when I saw the available colors were khaki, rust, plum, charcoal, and ivory.This chair was destined for the office, so I wanted it to be a yellow or green shade. The slip covers were a no go. I then got the bright idea that I could just purchase material from JoAnn’s (either on sale or with a coupon, of course) and create my own cushion covers. No problem, I thought, despite my total lack of sewing experience. I was looking for a way to infuse more green into the room, as we already had the yellow rug. 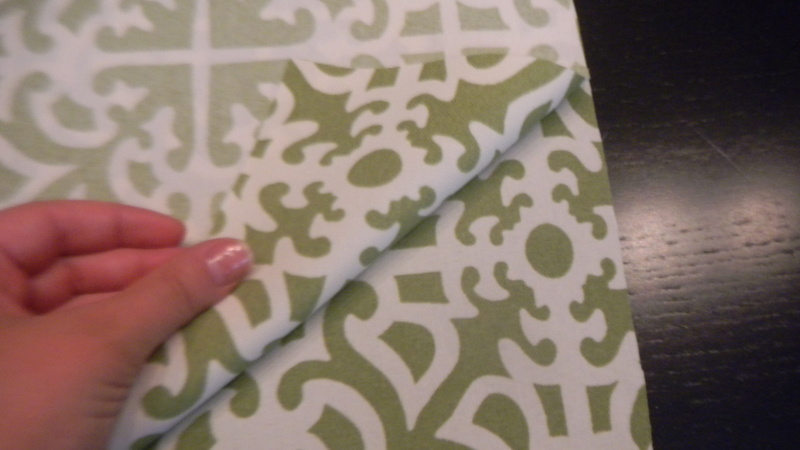 I knew the furniture would be painted white, so I thought that a green and white pattern would be best. I found the Waverly Lovely Lattice pattern in Jungle. 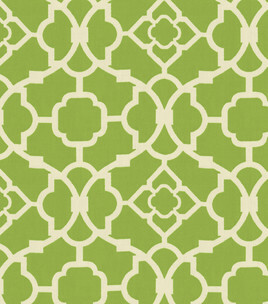 The pattern complemented the rug well, without it being too busy, or fighting it for the eye’s attention. I’m new to the whole “styling in layers” concept, so I didn’t quite trust myself yet. But, with Dan’s encouragement, we went to JoAnn’s and picked up a yard and a half of the fabric. I figured worst case, it was a wasted effort and we were out a few bucks. We brought the fabric home, and it sat in the office on that chair for quite a while as I went between ignoring it out of fear, and looking online at every sewing tutorial I could find. Eventually, I decided it was time to take action. From my research, I learned that you should start by measuring the cushion. It measured 18.5 inches by 24 inches. 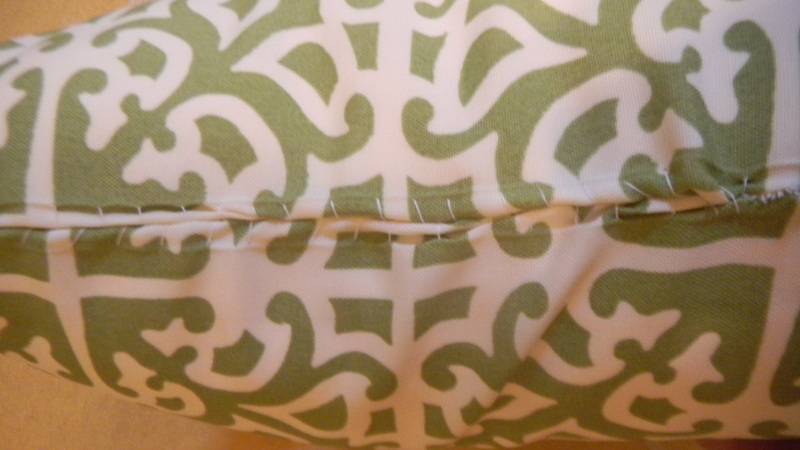 I added an extra inch to each dimension to allow for room to sew the seams. 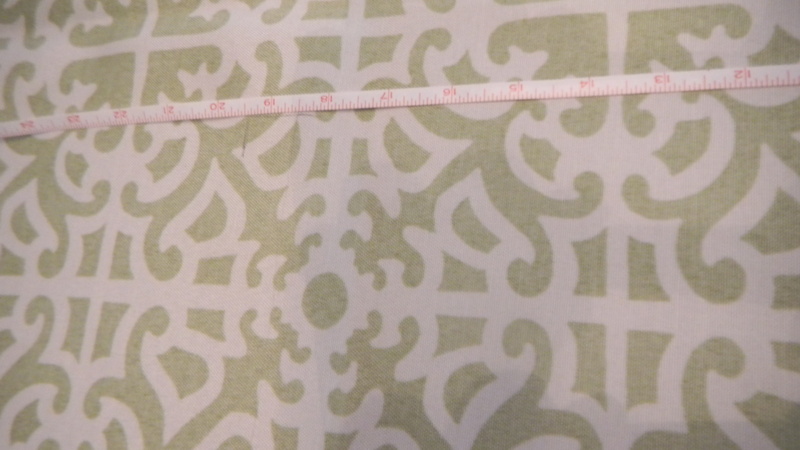 I measured it out on the fabric, and used a pencil to mark where to cut. I ended up with two pieces that I was going to have to sew together. By hand. Gulp. I lined the two pieces up together, with the underside of the fabric facing out. This is because you will turn the pillow right side out before putting the cushion into it. 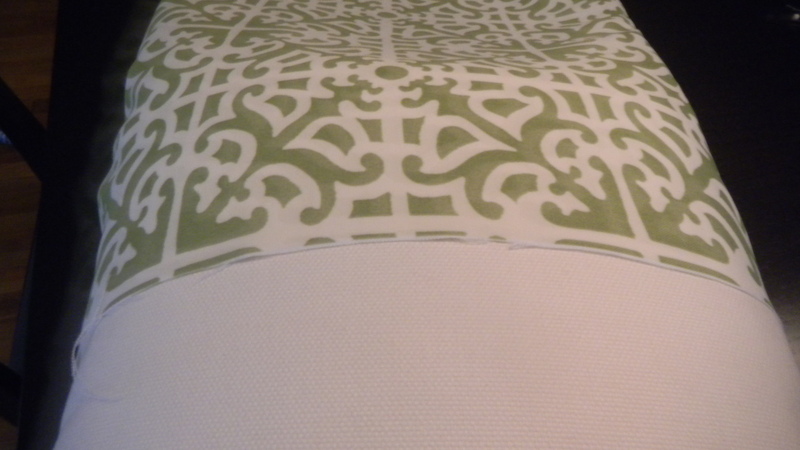 This way, the seams are inside the pillow and hidden away. So, I began the loooooong process of stitching the fabric together on three sides. 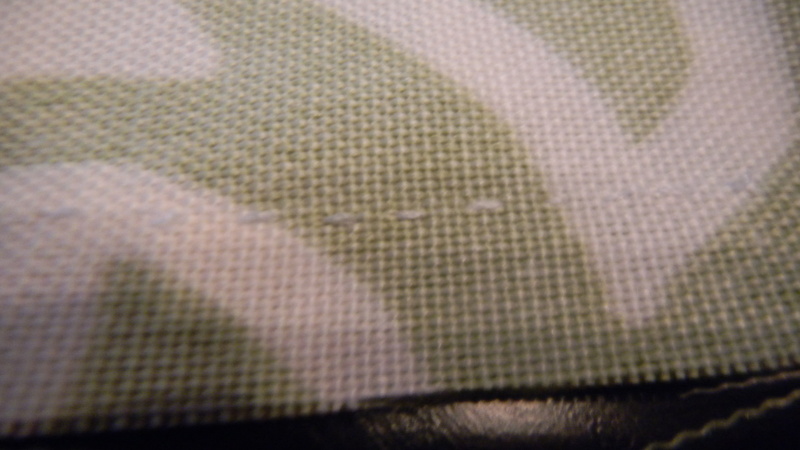 I tried to sew as straight a line as I could, and I tried to make the stitches close together. Eventually, after what felt like a million years (it was really only about as long as of Superbad), three sides of the pillow were sewn and I was ready to turn the fabric inside out. I was nervous, wondering if the seams would rip. Very carefully, I inverted the fabric. To my happiness, the seams held! Now my other nail-biting moment, would the pillow fit inside? It sure did – nice and snug, but not too tight! I did my happy dance right then and there! I was on top of the world! I could sew! I was on a high, that is, until I realized I still had that one seam to finish, and it would be the hardest one. Sigh. I consulted my research again, and I ironed the edges of the unsewn fabric in towards one another, creating the seam line I would follow when I sewed. From here on out, I had problems. I followed the slip stitch directions exactly, but my results were far less than perfect. I could still see the thread. The fabric puckered. I ran out of thread and had to re-thread the needle half way into the seam. The last bit of the two sides didn’t seem to match up correctly. Grrr. I ended up with a pretty ugly seam, but at that point, there was no way I was going to rip it out and try again. Maybe another day, but not that day. 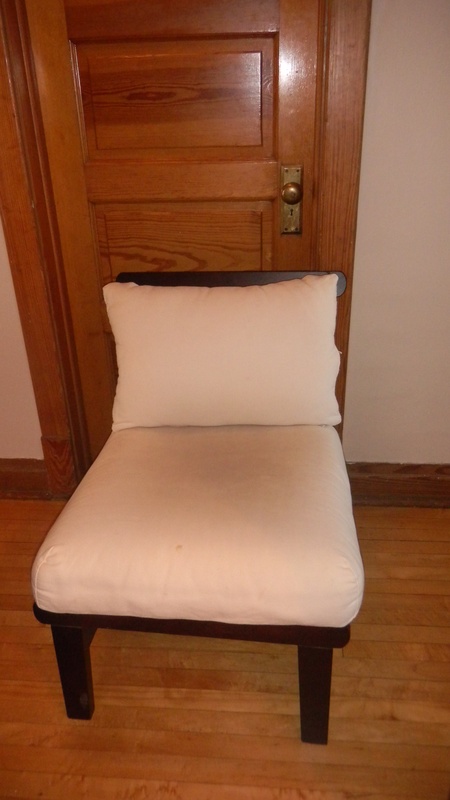 So, I placed the pillow on the chair with the seam facing the wall. No one will notice, right? That left the bottom cushion to be done, which was to be finished another time since I had filled my sewing quota for the day. I don’t know what made me think of it, but I had a moment of panic where I wondered if I would have enough fabric for the bottom cushion. At that point, I was ready to admit defeat, so I headed for the shower to get ready for a planned girls night that evening. When I got out, I saw that Dan had taken pity on me and tried to figure out a solution. He sort of wrapped the fabric around the cushion like he was wrapping a present, and then pinned it to the cushion itself. For now, I’m leaving it as it, but I know it’s not a permanent fix for the problem. There’s the dilemma. What should I do? 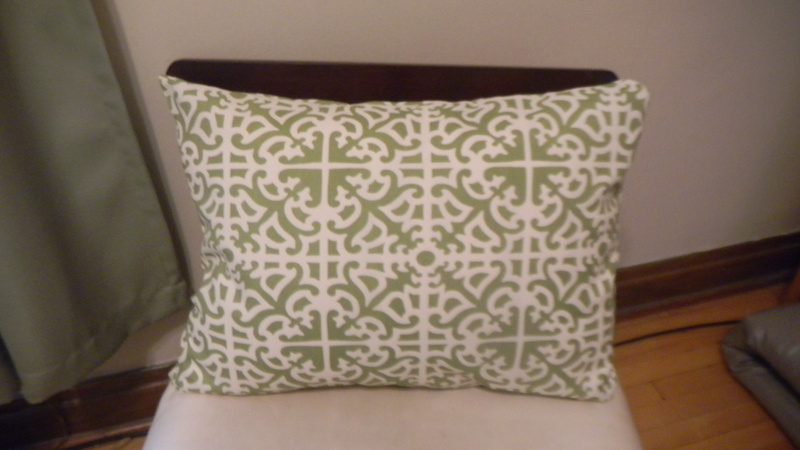 Get more of the fabric to have enough for the whole cushion, then make it like I made the smaller one? Sew the fabric as it is directly to the cushion? Just leave it alone and hope the problem goes away? Hey, maybe the cushion will sew itself, right? Any suggestions would be much appreciated. Hey girl! Love the blog. Will JoAnn’s accept a return? Like you could exchange the piece that was cut too short for a piece that is more adequate? That way atleast you wouldnt be out any $$. Nice work on the chair. I love the home projects. I recovered an old vintage chair grandma Vicky gave me that Tucker chewed on the beautiful brocade fabric. I found some new brocade fabric that wasnt quite as beautiful at JoAnn, but it looks much better with the new fabric on it! The chair I did, I was recovering the seat, so it is much different than your project. Sorry I cant help much, but love to see your projects! 🙂 Just think how many projects we can come up with when we have homes instead of apartments!! Thanks for the idea, Nat. Not sure if JoAnn’s would accept it or not because I have since lost the receipt. Grrrr. I think I just might go back and get more.I didn’t realize you re-did a chair. Good work! I’ll have to come see it soon. Yes, our houses will be very DIY!